We’re looking for a Project Manager with experience in print, email and Web, to join our award‐winning studio. You will be responsible for the day-to-day management of a number of accounts: liaising with outside suppliers, developing estimates, assisting with proposals, providing excellent customer service, offering guidance to both the client and the creative team, and building the business from within the existing client base. Highly organized and detail‐oriented, you must also have excellent communication and computer skills, including proficiency on Microsoft Word and Excel. Facility on a Mac is a bonus. 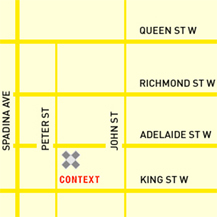 Context Creative is a Toronto based strategy and design company specializing in integrated communications campaigns. These include Web, Email, Print, Direct Mail and Social Media marketing. Please send your resume and cover letter, along with salary expectations, to cjevons@contextcreative.com. We appreciate all submissions and will contact eligible applicants for an interview.